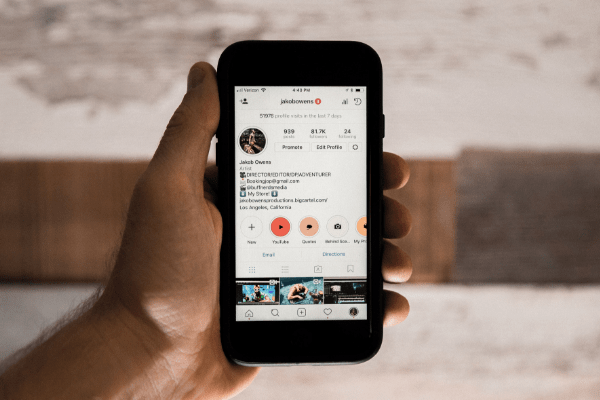 We’re sure you’ve heard the buzz surrounding Instagram business profiles, but maybe you’re still not sure if making the switch is right for your personal brand or business. Lucky for you, this guide has everything you need to know about business profiles on Instagram. With this information, you’ll be able to decide if an Instagram business profile is the right move for you. In 2016, Instagram announced it was testing business profiles. Users already recognized Instagram as an important tool for personal brands and businesses alike. Everyone was eager to learn more about what business profiles had to offer. A year and a half after they were rolled out, Instagram said it had 25 million active business user profiles. According to Instagram, more than 80 percent of its users follow a business account. Approximately 200 million Instagram users visit business profiles every day. 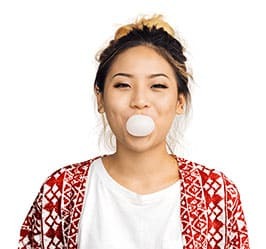 And, if all those eyes aren’t enough to convince you, Instagram business profiles also offer a variety of special features that could be just what you need to take your account to the next level. When you switch over to an Instagram business profile, you’re asked for a “category” in the setup which is then displayed under your name. This category helps to tell other users what it is you or your business does. Let people know what you’re all about. 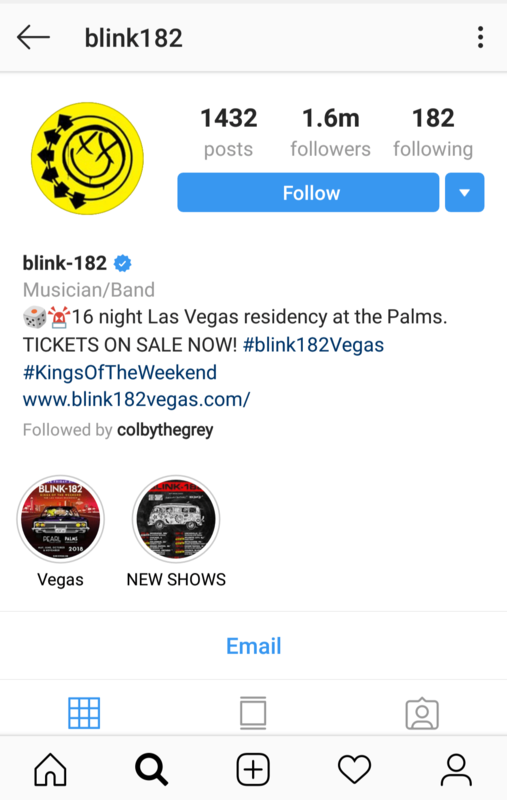 For example, Blink 182’s Instagram business profile (@blink182) tells users they are a band. At the bottom of the Instagram bio section (just after Highlights and before the grid starts), Instagram business profiles have the option to add “Contact” buttons. You can include a physical address, phone number and/or an email address. We love this feature because it allows your customers to contact you directly through your profile. Pro Tip: If you’re serious about reaching your ideal followers on Instagram, you need to be serious about your Instagram bio too. Check out our tips for writing a killer bio! Insights is an analytics tool which allows you to access information about your followers and your content’s performance. All the business gurus say you need to know your audience, and Instagram has made a feature that helps you do just that. 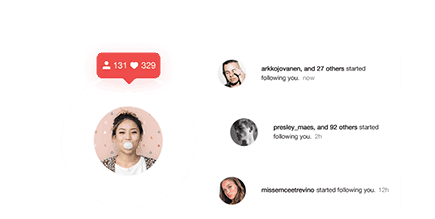 Find out who your followers are and when they’re most active on Instagram to help you decide the best times to post. With Insights, you can also see how specific posts and stories performed. This information will help you understand what your audience likes. In business (and, well, life in general), knowledge is power. You can track your impressions, reach and engagement all from within the app itself. If data and stats excite you (which they so totally should), this feature alone could make switching to an Instagram business profiles worth your while. Check out the screenshot below. 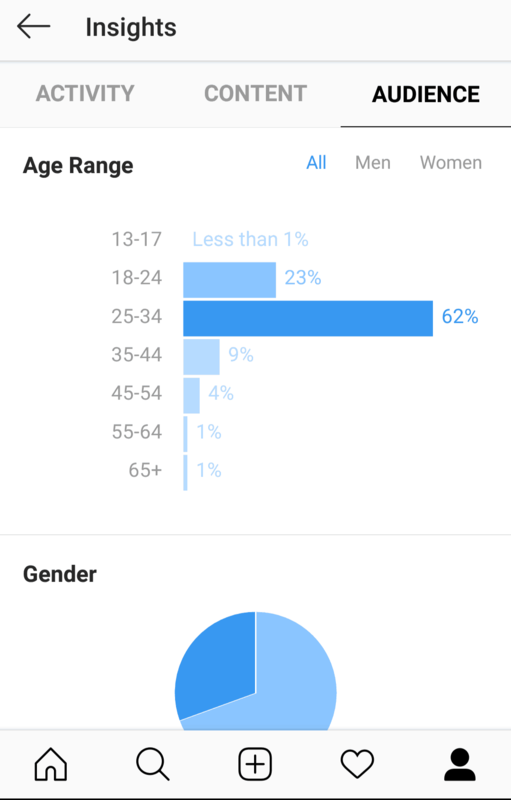 Insights will break down your followers by age, gender and location. A major Instagram trend right now is adding “Swipe Up” links in your Instagram Stories. While it can be used in a variety of ways, the majority of Instagram users utilize this feature to grow their email lists, sell products and drive traffic to their websites. Unfortunately, the ability to add links is only available if you have over 10,000 followers. But, if your account has over 10,000 followers this is definitely a feature you’re going to want to take advantage of. Pro Tip: Learn more about how you can use Instagram Stories to build your brand! Instagram’s parent company, Facebook, knows a thing or two (or a billion) about advertising. With an Instagram business profile, you can set up, run and track campaigns just like you do with Facebook ads. Instagram ads are an effective way for businesses to generate sales and build engagement aka make that money and grow your brand. This year, Instagram ad revenue is expected to reach almost $7 billion. So, yeah, we think you’re going to want to get in on that. Yet another helpful tool? Promoting posts. You’re probably already familiar with boosting posts on Facebook. Promoting a post in Instagram is pretty much the same idea. If the idea of putting together a whole ad campaign intimidates you, simply use this feature to take advantage of a post that has already done well. For a fee, you can help a post your followers already loved reach even more people. We said we were sure you’ve heard the buzz around Instagram business profiles. We’ll bet it wasn’t all rainbows and business analytics. Since their release in 2016, many users have worried switching to a business profile could potentially cost them engagement and organic reach. After all, that is what happened on Facebook back in 2014 when a change to their News Feed ended up stifling the reach of business pages. Basically, Facebook forced businesses to pay to have their content seen—even by people who were following their page. For now, this isn’t the case on Instagram. We understand engagement is a huge concern but still think tools like Insights make switching to an Instagram business profile worthwhile. Knowing all you can about your audience is vital for connecting them and growing your business. If you decide to try out an Instagram business profile but later decide it isn’t right for your brand, you can always switch back to a personal Instagram profile. Pro Tip: Did you know a portion of your followers aren’t even seeing your posts due to the Instagram algorithm? Learn more and read our tips for increasing engagement. Are you ready to get your hands on all the awesome business account features we’ve mentioned? Switching to an Instagram business account is actually super easy. You can do everything within the mobile app. Even before you do that, make sure your profile is set to public. Private accounts can’t make the switch. Instagram will ask you to connect to a Facebook business page. In order to do so, you must have Admin access to the page. It’s time to set up your business profile. Choose the category that best fits your business, and add your contact information. When you’ve filled out everything, tap “Done” to save your new Instagram business profile settings. Is An Instagram Business Profile Right For You? If you’re hustling on the Gram to get more followers, increase engagement or make sales, then without a doubt, you can benefit from switching to an Instagram business profile. We want to put your mind at ease over those Instagram business profile rumors. Your organic reach won’t be an issue with the help of Upleap’s dedicated account managers. We’ll help you grow your Instagram with organic followers. Check out our no-commitment free trial today. See what Instagram (and Upleap) can do for you and your business.